rec. 18-22 April 2017, Markus Sittikus Hall, Hohenems, Austria. DDD. 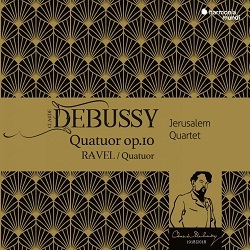 I almost passed this by despite the eye-catching Debussy-centenary-themed cover: after all, there are many very fine recordings of these two quartets, together (mostly) or separately. From 50+ years ago, the Supraphon pairing from the Vlach Quartet, which I bought the morning after hearing the Ravel on a beautiful Summer evening in the Holywell Music Rooms in Oxford, remains my benchmark. It’s available for download or streaming only, but it can obtained for as little as £3.19 and, though labelled ‘archive’, it’s not to be written off even sound-wise. To quote what I wrote in Autumn 2017/1, I’m pleased to see that it retains its magic – a pair of ripe and fulsome accounts, blending power and sensitivity, and it has remained hitherto my version of choice, still sounding well in digital form, alongside more recent versions such as that from the Belcea Quartet (Warner – download only), the Takács Quartet (Hyperion, Debussy with Franck Piano Quintet), Quatuor Ébène (Erato), the Dante Quartet (Hyperion) and the Talich Quartet (La Dolce Volta). I was about to write that the one snag is that the Supraphon offers short value, with just the two quartets, but the new Harmonia Mundi is no more generous. Nor is the 2012 Talich Quartet recording, which I also reviewed in Autumn 2017/1 and liked despite the irrelevant toy dog on the cover (La Dolce Volta LDV08). The Alpha release of these two quartets from the Quatuor van Kijk does add a short filler (reviewed alongside the Talich recording), but the performances fall a little – not too far – short of the ideal. Stuart Sillitoe mentions several other very fine recordings in his review. Having come belatedly to this new recording, I find it the equal of the others which I know, effectively recapturing the magic of that Summer evening in the 1960s, albeit that I listened in less ideal conditions in the hot July of this year. I’m not surprised to see as I tie up this review that Presto have made it their recording of the week and that the BBC Music Magazine singled it out as their choice of the month. It’s all too easy to impress listeners with dreamy ‘impressionist’ performances of these quartets; the original LP sleeve of the Vlach Quartet recording even encouraged that expectation with a fuzzy out-of-focus black-and-white depiction of men in top hats. The best performances, however, combine lyricism and strength and that’s true of the Vlach and Talich recordings and of the new Harmonia Mundi, which even matches the words which I’ve written above about the Vlach recording. I’m not even sure that I share Stuart Sillitoe’s preference for this performance of the Ravel; others have called it the other way, but for my money both are very fine. The Supraphon is now showing its age, though by less than I expected, but the new recording is very good indeed, especially as heard in 24/96 download guise, the only way to obtain better-than-CD quality now that Harmonia Mundi no longer offer SACD. As an introductory bargain, the 24-bit is available for the same price as 16-bit from eclassical.com, a reasonable $13.35. Their Talich download costs $13.51 (16-bit) or $16.21 (24-bit). UK purchasers may be able to find the Harmonia Mundi, but not the Dolce Volta, less expensively, especially after the initial period expires. Prospective collectors now have an embarrassment of riches to choose from. Pushed to make my Desert Island choice, the new recording from the Jerusalem Quartet might well be it, but I’d also want that Vlach download – and not just for sentimental reasons.